The Salvation Army believes in the power of music and how it can change lives. Youth in The Salvation Army's youth programs find themselves challenged to overcome adversity and develop into the people they may have only dreamed of. Music programs foster personal growth, persistence, and more. By offering these types of programs to underprivileged youth, they are being equipped with far more than just some lessons on a guitar or trumpet. Kids take so much more away from the arts than simply being able to play an instrument: they gain confidence, knowledge, motivation, and opportunity. The Salvation Army, Portland Tabernacle Music Program was established for the growth of music education in the Portland Metro Area. Its goal is to teach youth confidence and responsibility through music and visual arts. The music classes include theory courses, one on one coaching, small group instruction and instrumental practice (brass). 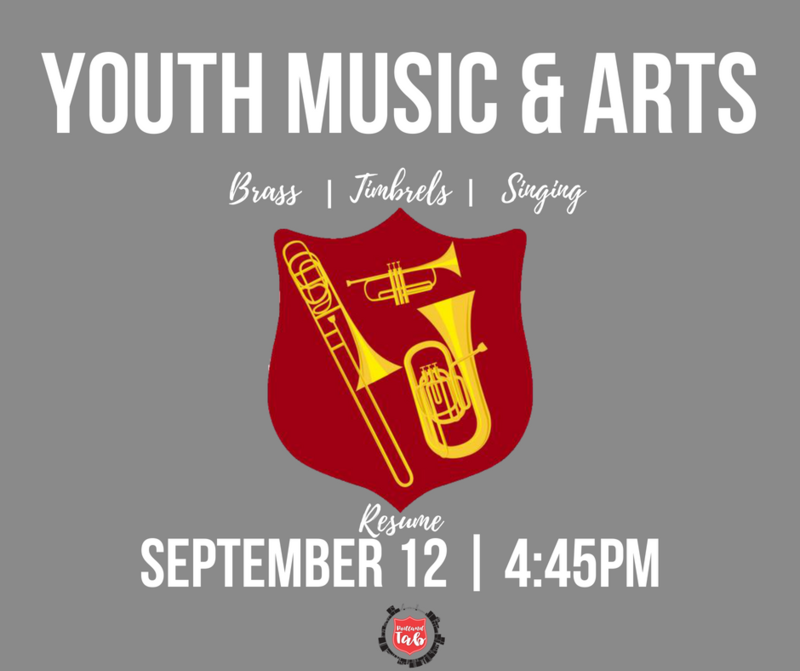 The Salvation Army Portland Tabernacle Music Program is open to all youngsters in the community between the ages of 7 to 18 upon spot availability. In order to maintain membership in any of The Salvation Army music programs, participants must show commitment to the program's guidelines. A band made up of brass instruments for children ages 6 to 18. This band is for children who are at beginner and intermediate level, and prepares them to play at a higher level. This also gives them the chance to play with other young musicians. Singing Company is a junior chorus of the church for boys and girls 5-13 years of age. They sing in Sunday services on a regular basis and at special events at the Portland Tabernacle Corps..
Our senior choir group provides music in the Sunday service and supports other ministry and service obligations. All members rehearse each week. Please contact us for more information. Our senior brass band provides music in the Sunday service and supports other ministry and service obligations. All members rehearse each week and music includes hymns, marches, and so much more. Please contact us for more information.